“The issue is that the iPhone interface is just as responsive as a computer, so you inherently expect the sort of performance you'd see on a notebook and it's just impossible on a device like the iPhone." 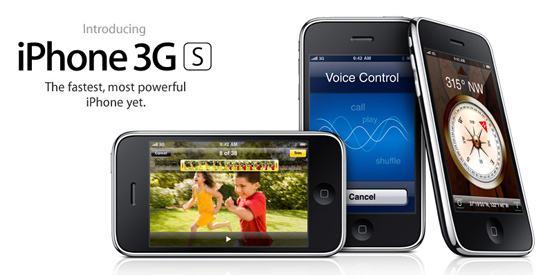 Two days ago, Apple announced the iPhone 3GS - designed to address one thing: performance. The other half of my complaint in the conclusion of my 3G review, addressing navigation and UI with the new expanded iPhone platform, isn’t addressed by the 3GS. I suspect that in another year we’ll see that. But today, it’s about hardware. After yesterday's Pre vs. iPhone 3G battery life article I got a few emails from people very close to the chips used in the iPhone 3GS. A couple of exchanges later and I realized it might be time to go a little deeper with the hardware behind the iPhone 3G, iPhone 3GS and the Palm Pre. 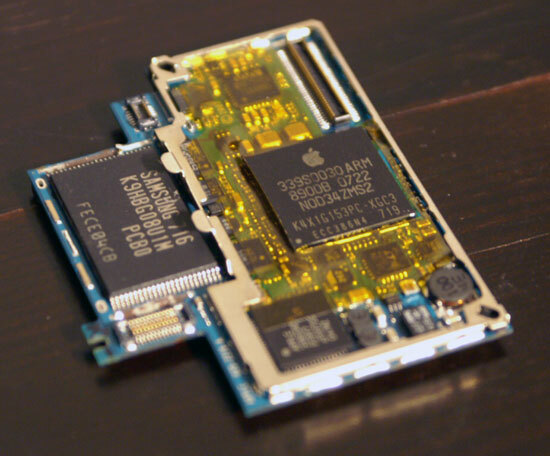 The iPhone and iPhone 3G use a system on a chip (SoC) from Samsung. The SoC is a custom part and actually has Apple’s logo on the chip. The SoC houses the CPU, GPU and memory for the iPhone. The CPU is based on the ARM11 core, in specific it is the ARM1176JZF-S. The CPU runs at 412MHz to save power, although the core is capable of running at 667MHz. 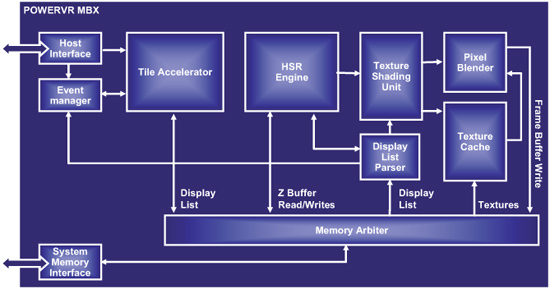 The ARM11 CPU is a single-issue in-order microprocessor with an 8-stage integer pipeline. It’s got a 32KB L1 cache (16KB for instructions, 16KB for data) and no L2 cache. The ARM11 CPU in the iPhone also has a vector floating point unit, but thankfully the SoC includes a separate GPU for 3D acceleration. You can think of this core as a very high clocked, very advanced 486. And extremely low power. Under typical load, the CPU core should consume around 100mW. By comparison, the CPU in your laptop can require anywhere from 10 - 35W. Idle power is even lower. The MBX-Lite in the iPhone shares the same architecture as the MBX but is optimized, once more, for power efficiency and thus is significantly slower. I don’t have exact clock speed information for the MBX-Lite in the iPhone but I’m guessing around 60MHz. Coupled with the CPU and the GPU in the iPhone’s SoC is 128MB of DDR memory, all on the same chip. It’s a pretty impressive little package. You get a CPU, GPU and memory all in a package that’s physically smaller than Intel’s Atom. Now the 486 came out in 1989 and the original 3dfx Voodoo graphics card came out in 1996. The iPhone’s SoC would be ridiculously powerful if it were running the sorts of applications we had back then, but it’s not. We’re asking a lot from this little core and although it has performed admirably thanks to some clever software engineering on Apple’s part, it’s time for an update. blah blah blah same crappy gameboy resolution screen blah blah blah talk to nokia blah blah blah. maybe if half the price of the stupid thing went into the device instead of paying for all the worthless marketing they'd have a killer device that i would gladly pay $130 a month for for unlimited data service. evaluation on parts; by the community). Arh, interesting question. I think everyone were too concentrated on its CPU, Memory and GPU and forgot the most fundamental / important issues. To be honest iPhone is rather weak for its Radio Reception. I think this is partly due to Infineon are new to Mobile Chipset. Is there an updated chipset to fix iPhone Comparatively poor quality reception? Was talking with the Apple engineers at WWDC which technical data sheets to look up concerning the GPU within the new iPhone. It's the PowerVR SGX 535. This chip is one up from the Palm Pre which is the PowerVR SGX 530. The difference between these is more video based than anything else. 535 has hardware acceleration for H.264 encode/decode, MPEG 4 and JPEG. It also handles HD content to 720p in real time. These specs seem to give a hint to what Apple are planning for future upgrades of the iPhone or other device. Suggesting, that if your developing for the 3GS then you're already developing for the next generation too. I really hope anand do some detail article on Mobile Tech. MIPS, ARM, difference between ARMv6 and v7. SnapDragon and OMAP. I mean if iPhone uses a SOC that is 90% the same as TI's OMAP, why not just buy it from OMAP? Do different implementation of ARM matters? How does Tegra compare to SGX, what about Mani ( ARM ) 's graphics department? There are about 10 dozens more questions i hope anand could answer. The truth is, as a tech news reader, i haven't been as excited as this for a long time. PC are already way too powerful then 90%+ of our needs. That is why Netbook are so popular. They are cheap, and gets the job done. The next battle, and most interesting development in the next decade will be on Mobile front. Where ARM and PowerVR dominate. PC tech are used to Intel and ATI/Nvidia so ARM and PowerVR's tech are Alien to us. Thanks. Hoping for more ARM info soon.